Bowman are giving away a bottle of juice from their entire range. 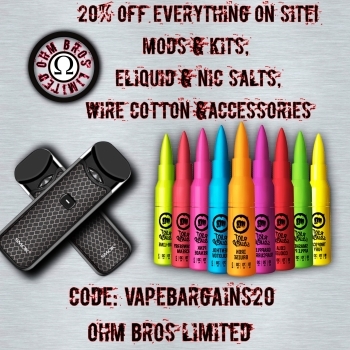 [Facebook Giveaway] Win IJOY Captain PD270 Kit, IJOY Capo 100W Kit & More. I VG are giving away 600ML Liquid, To enter like, share & comment your 2 local shop names! LIKE, SHARE, & COMMENT which mod you'd pick for a chance to win a coupon code for one of these three! 3 winners shall be randomly selected. LIKE, SHARE, & COMMENT your current mod setup for a chance to win a coupon code for either a Captain PD270 Mod in rainbow or a FireLuke Tank in green! Like, Tag 5 friends and Share this photo in your timeline to win your own Primo Dual.